Back in 2011, we were enamored of Caroline Preston’s “scrapbook novel,” The Scrapbook of Frankie Pratt (see our review; and our interview with Preston) for the innovative way the author paired vintage ephemera with smart storytelling. Now Preston has produced an equally endearing follow-up in The War Bride’s Scrapbook: A Novel in Pictures (Ecco, $29.99). Set during World War II, she tells the story of “furlough bride” Lila Jerome as she navigates her marriage to an army engineer she hardly knows during the darkest days of the war. Preston, a former archivist and voracious collector, conceived the idea for this story while paging through one of her collections, she told us. 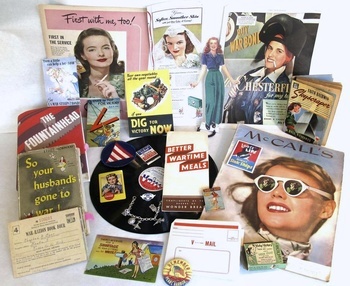 “I collect vintage scrapbooks and I was inspired by the WWII scrapbooks kept by young women on the home front while their husbands were at war. They were an interesting mixture of grim newspaper clippings, letters, military souvenirs, and memorabilia from their lives on the home front.” Her novel recreates that concept, with baseball cards, telegrams, postcards, and vintage advertising providing a dynamic backdrop for her narrative. In short, The War Bride’s Scrapbook will gladden the hearts of readers with a penchant for retro flair. Images: Book cover courtesy of Ecco/HarperCollins; others courtesy of Caroline Preston. Vintage Ephemera Sparks New \"Scrapbook Novel\"
Back in 2011, we were enamored of Caroline Preston's "scrapbook novel," The Scrapbook of Frankie Pratt (see our review; and our interview with Preston) for the innovative way the author paired vintage ephemera with smart storytelling. Now Preston has produced an equally endearing follow-up in The War Bride's Scrapbook: A Novel in Pictures (Ecco, $29.99). Set during World War II, she tells the story of "furlough bride" Lila Jerome as she navigates her marriage to an army engineer she hardly knows during the darkest days of the war. Preston, a former archivist and voracious collector, conceived the idea for this story while paging through one of her collections, she told us. "I collect vintage scrapbooks and I was inspired by the WWII scrapbooks kept by young women on the home front while their husbands were at war. They were an interesting mixture of grim newspaper clippings, letters, military souvenirs, and memorabilia from their lives on the home front." 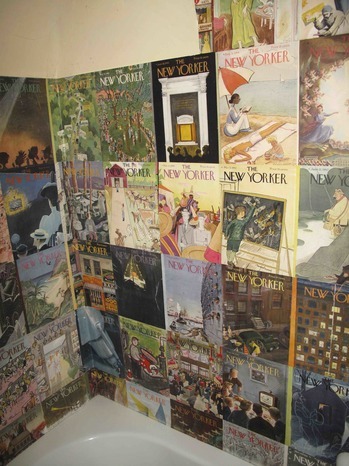 Her novel recreates that concept, with baseball cards, telegrams, postcards, and vintage advertising providing a dynamic backdrop for her narrative. 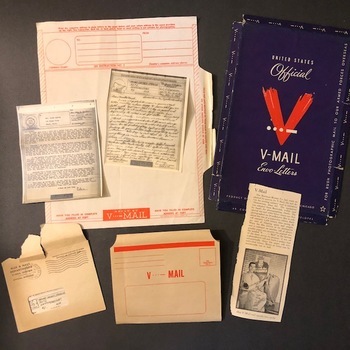 She said that her favorite pieces are "v-mail letters," adding, "These were form letters used by soldiers overseas which were then microfilmed and miniaturized. People at home would receive tiny photostats in tiny envelopes. I recreated these v-mails in my book, which work like captions." 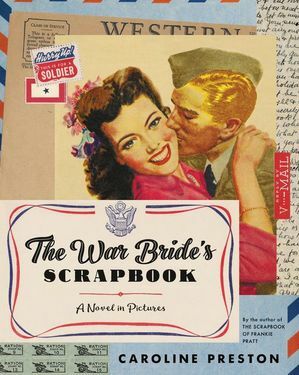 In short, The War Bride's Scrapbook will gladden the hearts of readers with a penchant for retro flair.